Ah! We are already well into the first weekend in December. Yikes! That means only 21 days left until Christmas. Saturday afternoon we headed down to Seoul for Mrs. B’s work Christmas party. We made reservations at a nearby hotel, so that we could take the rest of the day and night to finish up our Christmas gift shopping. We ate a nice meal with Mrs. B’s co-workers that consisted of a nice dinner buffet spread. We had a fabulous time chatting with everyone and getting to put some faces with the voice that had been on the other end of the line. You must to know that when any sort of party is planned in Korea, karaoke is an absolute must. What a sight to see! Many of Mrs. B’s co-workers had excellent voices! Mr. B hid from the microphone, saying that he had already flexed his pipes and filled his quota already this year. While we were there a Korean women working the party at the restaurant approached Mrs. B wanting to see the back of her haircut. After chatting for only a brief moment she immediately grabbed her side and kept saying how thin and tall she was. This led right into the question, “how often do you go to the bathroom?”. Baffled we both had to have had this look on our faces, did she really just ask that?? Mrs. B, trying not to laugh and be rude, answered the best way possible, “I think as much as a normal person goes”. Something’s like this experience truly remind us were not in the US anymore…it’s Korea.. there is no personal or private questions here. She continued well into the next 10 minutes with probing questions about eating habits and using the bathroom. Yikes! After the party we headed to our hotel, checked in, dropped off our overnight bags, caught a cab and started our shopping adventures. The first stop was to the Namdaemun marketplace where Mrs. B’s had visited the weekend prior. Mrs. B was super excited to share the experience again with someone new. We haggled, shopped and met some very interesting characters, ha ha ha! You have to check out the photos if you haven’t already done so. After the marketplace we headed off to Hello Kitty to pick up A good friends daughter something little. Mrs. B was in absolute hello kitty heaven! Walking back to the marketplace we came across a street vendor selling egg bread known as, Gyeran Bbang 계란 빵, that Mrs. B had been looking for. It was soo yummy! With the cooler weather setting in you will find more and more of these warm treats being served up by the street vendors. So how can we describe Gyeran Bbang? Well, it sort of reminds you of french toast but with more egg. There is a slight sweet taste to this street snack but it’s very light. Yey! Another item to cross of her Korea to do list. We decided to try to hail a cab to head back to the hotel to drop off our bags. We weren’t very successful at first we decided to take a break after being totally passed over by various impatient Koreans. We spotted Holly’s Coffee. The beans were pretty strong, just enough to pep us up and go back outside and give it a go again. Much better this time. We got a cab! We headed back to the hotel and dropped off the bags. While Mrs. B waited on Mr. B, she played around with her camera and took various shots of the Seoul tower at night. We had a breathtaking view from our hotel of the tower light up. The Greek souvlaki restaurant, known as Santorini is located in the alley behind Hamilton Hotel. Santorini is just a tiny piece of Greece located in the middle of Seoul. The owner is Greek and offers a traditional Greek menu. Mr. B ordered the pork souvlaki (YUM!) and Mrs. B ordered the Moussaka. Appetizers cost between 8,000 to 15,000 Won, meat souvlaki dishes cost around 18,000 to 20,000. 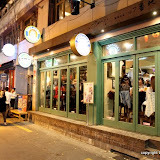 Directions: From the Itaewon subway station exit #1, Look for KFC on your right, Make a right, walk uphill and make a left at Bliss. While walking keep looking for Santorini on your left, it’s located on the 2nd floor. It’s very easy to locate! After dinner we were both pretty beat from the adventurous day. We originally had plans to grab some drinks at the various pubs and eat “the most amazing hot dogs ever”. However, our bodies suggested otherwise. We walked back to the hotel. Along the way we saw some very interesting advertisements. Yes! Only acceptable in a foreign country, Ha ha! Check out our attached photos to see what we talking about. We got back to the hotel and had to snap some cheesy Christmas photos in the hotel lobby. You know, just because! Besides, the lobby was decorated so beautifully and we Bee’s decided not to have a tree this year because we were not going be home to actually enjoy and admire it. Lying in bed we started to talk about the holidays and how different it would be this year because we were both abroad. Mr. B is quite used to being away from family. Mrs. B on the other hand has never had these experiences. With that being said Mrs. B decided that Christmas does not have to mean a trillion lights and over-organized parties, or spending until your wallet cries out (unless, of course, you want to…that’s fine too). No, Christmas and the holidays should be about starting your own sort of traditions, your own ways of celebrating the way you want and that includes with the people you want to celebrate it with. It should be the time of year when you give everyone an extra hug, or tip the waiters more than usual, or spend quality time with your loved ones and close friends during the weekends, just because! Whatever you end up doing during the holiday season, do it with joy in your heart and everyone around you will brighter because they are in the presence of a joyful person.